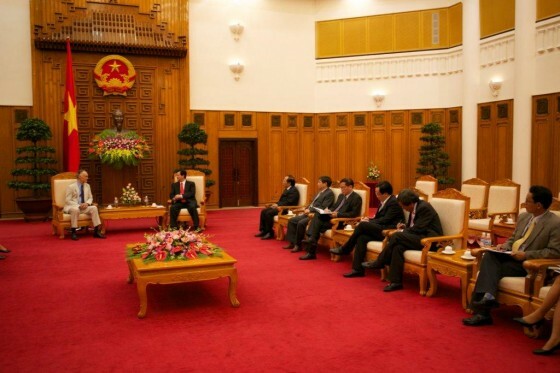 Bernard Weber, Founder-President of New7Wonders (left), meeting today in Hanoi with Nguyen Tan Dung, Prime Minister of the Socialist Republic of Vietnam (right). 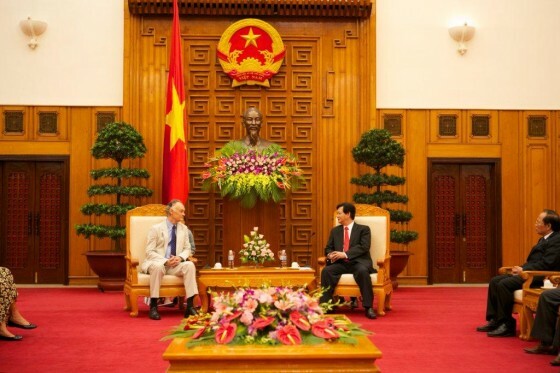 Hanoi: The Founder-President of New7Wonders, Bernard Weber, today met the Prime Minister of Vietnam, Nguyen Tan Dung, at government offices in Hanoi. The meeting was also attended by Hoang Tuan Anh, the Minister of Culture, Sports and Tourism, and by New7Wonders directors Heidi Weber and Jean-Paul de la Fuente. Prime Minister Dung praised the New7Wonders organization for bringing millions of people together in a global campaign that has helped raise awareness of the world’s natural heritage. He stated that Vietnam would work closely with New7Wonders to help it achieve its goals, and he declared his support for such initiatives as the planned first New7Wonders Congress. Prime Minister Dung added that the election of Halong Bay as one of the New7Wonders of Nature was a source of great pride to the people of Vietnam. Tonight, in the My Dinh National Stadium in Hanoi, the first of two major events celebrating the election of Halong Bay as one of the New7Wonders of Nature will take place.